I’m not ashamed to admit that there are entire passages of The Glenn Miller Story that leave me with a big smile on my face, the whole sequence that runs from Miller ‘discovering’ his sound through to the beginning of the climactic war segment. The film focuses on the songs, those immortal big band tunes, and by this stage has established Miller as such a likeable presence that the sight of him finally making it and giving joy to the masses through his music is just an enormous pleasure. 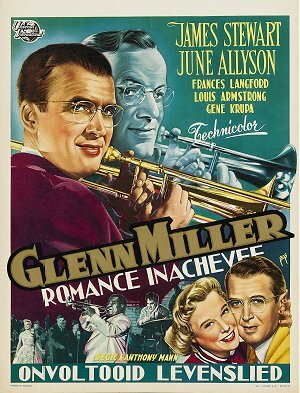 The Glenn Miller story follows Miller (James Stewart) from his early days as a struggling trombonist, working from band to band whilst attempting to get his own arrangements noticed. His instrument moves in and out of pawn shops as his fortunes fluctuate, and whilst his talent as a musician is never in doubt his attempts to get recognised for his compositions fare less well. Miller has faith in himself, but knows he hasn’t yet hit upon the right sound and this eventually comes about as a combination of hard, painstaking work at the piano and a turn of fortune. In the meantime, he courts and marries Helen Burger (June Allyson), almost the perfect American wife – loving, endlessly supportive, the practical, financially savvy partner to his artist – and much of the film tracks their idealised relationship, and his use of her as a muse for such famous tracks as Pennsylvania 6-5000 and Little Brown Jug, whilst Helen herself comes up for the title of what will emerge as Moonlight Serenade. Incidentally, the film was nearly called Moonlight Serenade, and indeed carried this title in certain countries. It’s lovely stuff, with the almost complete absence of tension compensated for with good music (I’m listening to Miller whilst writing these words) and Stewart’s heartwarming chemistry with Allyson. As a directorial project for Anthony Mann, it’s a departure. At the time, his collaboration with Stewart in a string of brilliant and gritty (for the time) Westerns was extremely fruitful, and it was the actor who persuaded him to sign up for The Glenn Miller Story, which turned into a major hit for Universal. 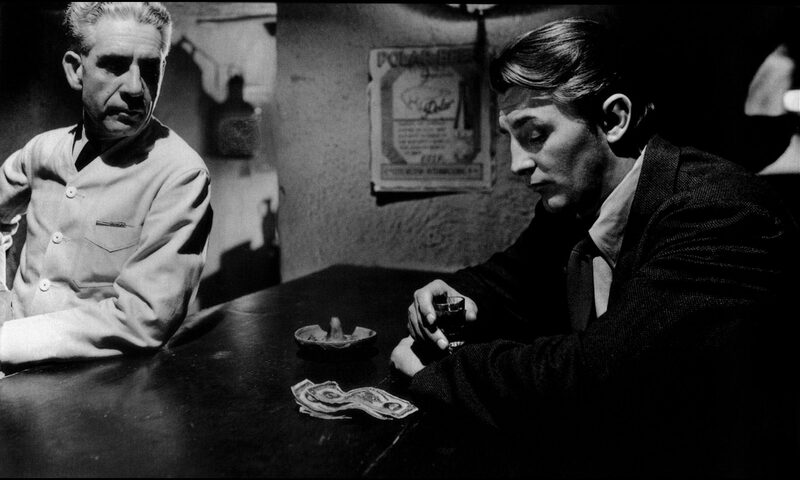 Mann brought to the project his usual sense of economy, the film never dragging as the narrative moves seamlessly through Miller’s career. There are also some great moments. My favourite has Miller and his band playing In the Mood for injured American soldiers in Britain. It’s wartime; the bombs are still dropping and whilst the song plays a V-2 rocket soars overhead, then the engine cuts out, which means it’s about to drop. GIs duck or rush for cover, but Miller makes the band play on as the bomb explodes nearby, making a triumph of the music over destruction. Visually, it’s as good as one might expect from a Mann film. It features fine use of Technicolor, most prominently in a scene where Miller and Helen go to see Louis Armstrong (appearing as himself, along with various other musicians from the big band era) play in a jazz club, a projector turning the performers into a kaleidoscope of colours to go with the freeform music. Harry Morgan, in real life a good friend of Miller’s, co-stars as his best mate and pianist, Chummy. It’s Stewart’s film, though. Having the benefit of actually looking like Miller (a fact nicely teased out by the poster I chose for this entry), he went to the trouble of learning to play the trombone for his performance, although he was never skilled enough for the film and his scenes were dubbed by Joe Yukl, who would perform off-camera whilst Stewart’s correct hand movements gave the impression of authenticity. The film builds to a poignant close, with its gentle scene of a heart quietly breaking, but music emerges as the triumph. It’s a really great picture. Don’t know why, Mike, but I’ve never seen this film. And me a big fan of Mann and Stewart too! Something to put right in 2015. That is a surprise Colin, but understandable given Mann saw it as far from his natural material to work with. It’s a real charmer though, which I must give a viewing to at least once every couple of years or so, and as mentioned in the write-up it always leaves me smiling.